Can you believe my team decorated this cake for Kelly Ripa's Cake Off for a Cause? I can't believe it either! Sandy, Megan and I had a blast decorating. The time went so quickly when we looked up it was over. I was ready to do another cake. I’m home finally! What a snowy trip. I missed my kitchen and my family! Why didn't I pack my Mactop again? That’s ok, The Strand Bookstore kept me entertained with the Percy Jackson & the Olympians series. The entire series. I know, I’m pathetic. Instead of sleeping I decided it would be a good time to devour all five books. New York was great, so was meeting the other food bloggers. And did you know the people of Manhattan are nice? They are! I walked around for days talking to them. I decided to be a local and not take my camera along, so I don’t have a ton of pictures. I spent time with my friend Kathia and my new friend Christine, bummed around Chelsea Market and Whole Foods at Union Square watching out the window as a college kid dropped into the snow to make a snow angel. I talked to people on the subway, in cabs, and on the street. I walked for miles in the snow and spent a wonderful afternoon at the Metropolitan Museum of Art. 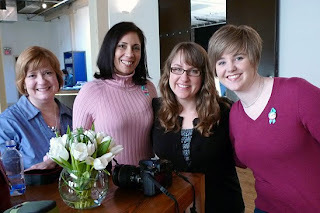 Just us food bloggers waiting to decorate cake. Will you vote for our cake"Fall for Me" please? There are only five days left. When you vote you’re entered to win an Electrolux range, and better than that $1 goes to fight cancer every time a vote is cast. You can vote once a day until it’s over. 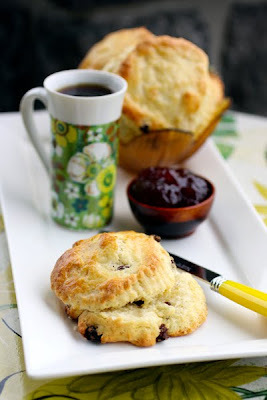 Although good plain, feel free to add a couple tablespoons of orange zest, some cinnamon, or even grated fresh ginger to this plain raisin scone recipe. Store leftover scones in sandwich bags and freeze for a quick breakfast on busy mornings. 1. Place oven racks in the top lower and upper third of the oven and preheat to 425 degrees. Line two baking sheets with parchment paper. 2. In a food processor pulse together the flour, sugar, baking powder, and salt. Then add the butter 1/3 amount at a time and pulse just until combined each time. You want pea sized butter chunks. 3. In a stand mixer or a large bowl. Beat together the eggs and heavy cream. Add the flour mixture and beat until just combined. Then mix in the raisins. Dump out the dough onto a clean surface and knead for a few turns adding a little flour if needed until dough is only slightly sticky. 4. Flour a clean surface and roll or pat down the dough until it’s about 1 inch thick. Cut out shapes with fluted a 3 inch biscuit cutter (or any shape you prefer) and place two inches apart on the parchment. Brush tops with egg wash.
5. Bake for about 15 minutes or until golden brown rotating cookie sheets halfway through baking time. It was so great to meet you Laura! The scones look delicious and of course I'll vote for you, as many times as they'll let me! It sounds like a fabulous trip. Beautiful cake! I have voted and will continue to do so. The scones look divine! you've got my vote! the scones look delish. I am so happy you anjoyed your trip! That cake really is beautiful, I will be sure to vote often! I never understand why people are surprised NYers are nice. We are rated one of the friendliest cities in the US! You need to come ack in the warm weather to see the farmers markets. Now if you will excuse me, I have to get a jump on St Patricks baking with those lovely scones of yours. Cake looks fabulous - love the theme and execution. Just voted for you!! Laura, it was great to see you on video!! I'll vote for your cake. I voted for you! It looks your team is already in the lead! Great job! These scones look amazing. I think they look very pretty. Are they soft and moist? i love scones... these scones look beautiful! I am going to post this on my blog too, I hope that's ok - if not, let me know? I really hope you win!! Oh, I wish I would have had time to go to the MoMA!!! How fabulous!!! Um, YOUR cake is winning BIG time...and raising lots of $$$ for OCRF, yay! That cake is divine. Congrats on such a beautiful work of art! That cake looks divine....ofcourse, I voted for it! Glad to hear that you had a great time and made it home safely!!! So far it seems your team is a winner, and I will go back and vote if they let me! I've been voting. Glad you had such a great trip. The scones look yummy. WHat a gorgeous cake! Those scones look fantastic too-- sounds like you had an amazing time in NY. Yay! Just voted for a good cause. Crossing all fingers and toes for you. Registered and voted. Your cake is absolutely gorgeous! Sounds like you had a great trip - and the scones - oh my! Wow, the cake is just beautiful! So nice the trip turned out to be as nice as you expected. The cake is fantastic. And I love scones, make them all the time. Love to have them in the freezer for when company drops by I can serve them with tea. Ah, the cake, the scones...voting for you...Done! great cake... hope you win!!! Laura! I just made your raisin scones...delish...I added some ginger, vanilla and some sugar to the top of the egg wash :] I made mine a bit smaller so I have more to share and put in the freezer! They taste yummy...I'll be putting them on my blog! 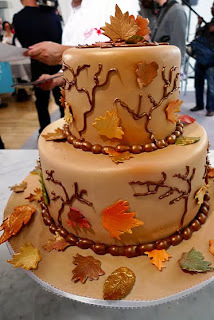 Your cake looks fabulous(I love fall! )and it sounds like you turned the entire trip into a memorable experience all the way around! FUN!!! PS - NYers have always gotten a bad rap, unjustly I might add. Aw nuts... how did I miss this post??? Wow, so glad you were included in this fun event! Great job with the cake too!!!!! !